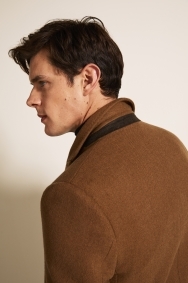 Bring colour to cold days in camel. 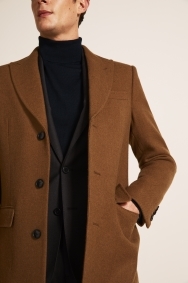 With its on-trend colour and classic tailored fit, this Moss 1851 overcoat combines style, comfort and warmth - everything you need when the cold bites. Crafted in double face fabric for texture, it also features half-lining with a light grey internal for stylish contrast, plus a peak lapel to add interest to your collar. Wear it with an oatmeal polo neck jumper and a grey flannel suit for a look that works for the office or smart-casual occasions. Very stylish and eye-catching coat, It looks what It is, classy! 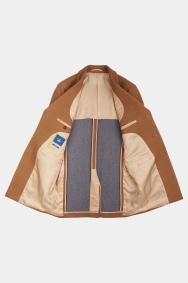 It's an awesome coat. Very smart. Further reduction of the price was a welcome surprise. 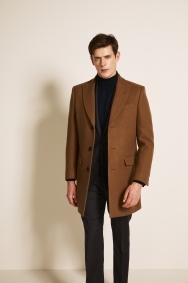 Very good looking coat and a nice fit. 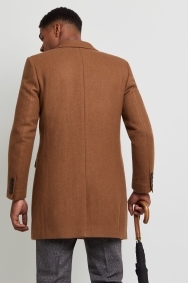 My partner loves his camel overcoat! It’s such good quality. I love Moss Boss, their suites, their customer service, and just the way they are. I have 7 suites from you and wouldn't go anywhere else. Even buying my wedding suites there.